Lily-of-the-Valley (Convallaria Majalis) is my favorite flower. It’s dainty and has a wonderful fragrance, but is very poisonous. While flowers will open in the garden in May and June, they may also be coaxed into blooming by the gardener. Let’s see how to grow lily of the valley. Native to Europe, but also naturalized in the eastern United States, Lily-of-the-Valley is one of the prettiest flowers found in the wild. It grows in open woodland, is easy to grow in the garden and can be forced into bloom artificially any time of the year. 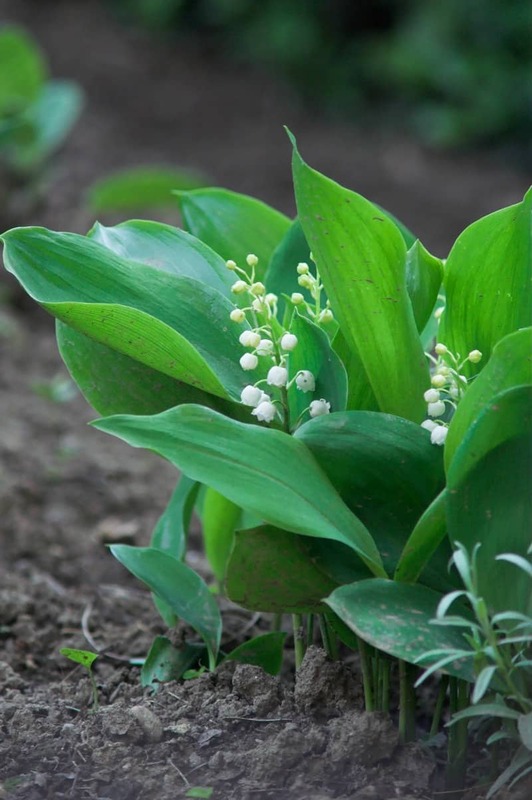 The botanical name Convallaria meaning “Lily-of-the-Valley”, is biblical in origin: The tears of Mary Magdalen, shed during her embalming of Christ, they were said to have flowed to the valley, where they sprang into life as lilies. 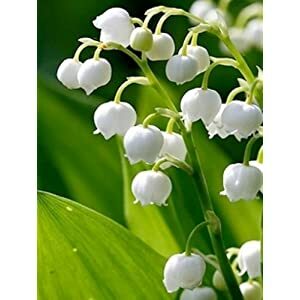 Lily of the valley is a perennial with strong roots and a white, underground, creeping tuber, partly horizontal and partly upright. This tuber has a short, thick shoot, called pip from which grow leaves and flowers. The leaves have long stems, surrounded by smaller leaves at the base. The white, bell-shaped flowers hang on short stalks in 6 to 10 inch clusters. They have a strong, heady scent. Want to learn more about scented gardens? Here’s a list of fragrant flowers you can try. 12 Lily of the Valley Hardy Perennial Plants Pips Bulbs with Roots Buy tubers that will bloom at desired time of year. Check that roots are fresh and not dried out. While you can buy lily of the valley tubers almost any time of year, in the wild, the natural blooming season is from May to June. These beautiful flowers are very easy to grow: once you plant them in the right conditions, they bloom each year in the garden. Many people look for lily of the valley bulbs, but they are actually called pips and don’t really look like a bulb. 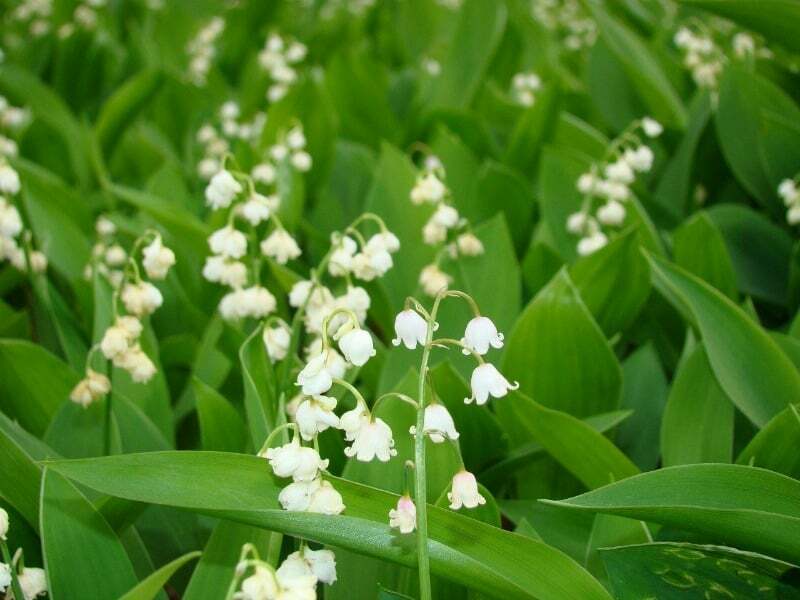 You can buy lily of the valley seeds, but you’ll need to be careful, as the red berries of the plant are poisonous. Wear gloves while handling them. You should be aware that growing this plant from seed will mean waiting to see flowers for several years. It’s best to just plant pips. Plant pips in the fall before freezing about 1.5 inches deep in clumps. Lily of the valley likes it best in the shade, with just bit of sunshine for good measure. Many years ago we live din MA and had a forest full of them: I can’t even begin to describe the feeling of walking through that fragrant forest every spring! Remember to keep your freshly planted flowers watered well. 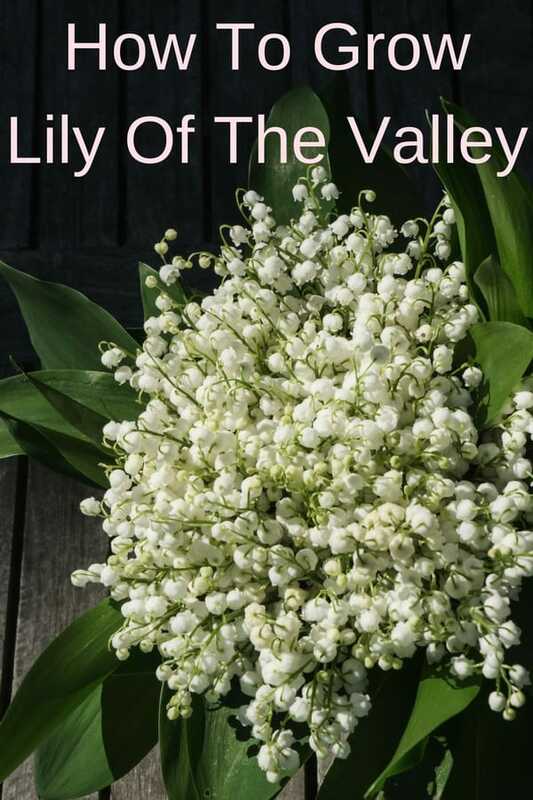 Lily-of-the-Valley can be forced at any time of year by professional nurseries and is often used in bouquets. Buy plants for forcing in October or take them from the garden after two to three year’s growth. Put the plants in the ground immediately after purchase and don’t allow leaves to dry out. Use pots with good drains. Trim the root to three to four inches and plant in garden soil mixed with sand. Water well. Bury pots in the garden and cover with sand or moss. Move the flowers indoors for forcing in December, or even later, and give them a warm water treatment at about 85°F. Stand pots (at 77°F) in dark, humid spot for the first 12 days. When stems have reached about four inches, the temperature can be lowered gradually to about 66°F and the plants slowly introduced to the light. Forcing flowers takes about four to five weeks. These adorable bell shaped flowers woudl make great gifts for Mother’s day if you planted them in a pot. Here’s how to do it! Harden to find, and a bit more expensive, pink lily of the valley flowers are just as pretty and delicate as their white sisters. They look great indoors potted up, or used a fragrant ground cover. I’ve never seen one personally, but I hear blue lily of the valley are gorgeous. The flowers open in May and June, followed by eye-catching red berries. These, like the rest of the plant, are very poisonous. Despite that fact, the plant been used as medicinal herb for centuries. The plant’s soluble glycosides can be used for various heart ailments, but are not without danger. Don’t try to ingest any part of this plant. In fact, wear gloves when you handle its berries. Keep pets away from your lily of the valley flower bed. Click here to find out what other plants are harmful to pets. If you see spotted leaves your plants probably have a fungus infection (gray or brown spots). Use a fungicide. The lily beetle’s larvae can cause holes at leaf edges or centers. These larvae are brownish – green, while the adult beetle is a bright red. Pick the insects off or spray with systemic insecticide. Do not let roots dry: gray mold can attack dried shoots. I hope that this little guide showed you how to grow lily of the valley in your own backyard.